I tend to do one about every five or six years just to keep me up to date! It wasn't being done for 34 mph on the A40 on a downhill section, after dark, in the rain and at a place I'd never been to before that annoyed me. No it wasn't that, and I suppose I could be relatively gracious and say I learned a couple of things on the course and therefore it wasn't 4 hours totally wasted, even though it won't change anything about the way I drive. But rarely in my life have I been so relentlessly patronised by a couple of smugly sanctimonious 25 year old know alls, who so obviously relished treating us if we were schoolkids in detention for running in the corridors. I did get a bit of revenge at one point when the lad was lecturing us about mini roundabouts and pointing out that you can be done for putting a wheel on the central white disc. I offered him the chance to see if he could drive a normal car either into or out of the lane where I live without running over the mini roundabout. Cocky little sprat knew where it was so didn't have much to say. It was never a case of taking ti on the chin or manning up. I took the offer of the course but I thought going 5mph or 16% over the limit (not 18% as suggested by our sanctimonious friend) was very low to get a prosecution. 4 hours in a classroom isn't my idea of fun but it's not the end of the world. Anyway, all done now and I can go back to being squeaky clean like I normally am. Best adjust your outlook for the course, you only get one every three years. Have to confess that I wasn't paying attention when I got caught by a camera positioned a couple of hundred yards into the 30 mph zone going downhill on a wide road with very little, if any, other traffic about. My own fault. When we were questioned at the start of the course about the speed limit we actually broke, I noticed that there was no one caught in a 20 mph zone and I questioned this. I was told in no uncertain terms that there wouldn't be. This was back a bit when that limit was more reserved for schools in particular and you weren't given the option of doing the course. Having said that, I will also confess to experiencing a degree of satisfaction/pleasure in noticing that someone else didn't take too kindly to getting caught and has reduced said camera to a burned out crisp. Maybe then, ALL speed limits should be upped to 40, then you would have to be doing 45mph to 'get done'. WHERE do you propose to have the limit ? Having driven on the M6 today, the standard of driving is absolutely frightening and is only getting worse. HGV's weaving on and off the hard shoulder, whist sending texts. German cars exiting from lane 3 to the slip road, or conversely entering the motorway and straight out into lane 3. Drivers hogging the middle lane, except when they enter lane 1, or 'the telephone lane' ! Having left the motorway and entered a 30mph zone, followed by a 20mph zone, it seems as if you are crawling. The bunch of flowers on the next lampost, would say otherwise though ! IF you are going to drive at speed on public roads, you need to be far more aware than usual and especially more aware than the average motorist is. But hey, what do I know, my job was to just scrape up the aftermath and then tell the relations left behind. Best adjust your outlook of thinking anyone cares what you think. What the hell does any of that have to do with creeping slightly over the speed limit? It's great to know I share a forum with such perfect people who have never erred in their lives and feel the need to tut-tut and patronise those who have. I find I don’t drive anywhere I don’t know without having the TomTom app on with the speed camera map / notification running. Yes, cameras outside schools, I’m all for that but that’s none of the speed cameras / speed traps near me. What I can’t get to grips with is the arbitrary nature of it all. Down the road from me there’s a single carriageway main road running to the A12; 20 years ago it was national speed limit now it’s a mix of 30 mph and 40 mph and the mobile speed trap is always 10 yards the other side of the 40 into 30 mph sign. Truly amazing that in that 10 yards 40 mph becomes so dangerous, triggering points, a fine, expensive speed awareness course etc. It’s just an industry now. Anyways, when did ‘speed’ become the last word in evil on the road? I suppose speed enforcement you can automate but drink / drug drivers and plain bad drivers need real police and we don’t have any of those left. I digress. Lots of cameras are positioned to catch you at speed change points. This they know will generate the most money. It's that bad car manufacturers are fitting automatic speed limiters to lots of cars. All this 20mph stuff, what's wrong with teaching kids that roads are for vehicles and they can hurt and kill you. Schools had barriers erected to stop the kids running straight into the roads. If they run around them and then do it. That is not the motorists fault. Were becoming a full on nanny state. Indeed, when I was at school we were taught to stay out of the road and now we are taught that anyone driving over 20 mph is at fault. As a last observation - the last set of points I got (some number of years ago now) was 98 mph on an empty M4 on a sunny day and I was lasered from 1 km away and I got the letter within 2 weeks. If all of this is about ‘road safety’ how does a letter 2 weeks later, 3 points and a fine help that? I could have been drunk as a skunk off my head or intent on finding the car’s speed limiter further up the M4 at 150 mph - there’s no real policing, it’s automated revenue generation in the name of road safety. In fairness though, I know it’s a numbers game (and it is a game) and ‘it is what it is’ as the kids say. I went to the course with an open mind and I did learn a couple of things, but I have to say there were a couple of dubious "facts" being bandied about. I can't corroberate them on the internet and the people running the course (nice couple) couldn't cite the sources. Fact 1: You have a 1 in 200 chance of having an accident when you drive (not fatal or injury, just an accident.) I can't see that as I drive every day, so that's at least 700 journeys a year, meaning statistically I should have about 3 1/2 accidents a year? I don't (touch wood) so does that mean someone else has 7 a year to keep up the average? The figure also doesn't distinguish between a journey to Scotland or to the shops, so I don't actually believe that one. Fact 2: Someone mentioned that the stopping distances in the Highway Code were written so long ago when cars were not so safe, and that new cars with ABS and disc brakes all round stop a lot quicker. The answer was "No, new cars are a lot heavier now which counteracts that and the stopping distances are the same." This has to be hogwash, surely. A new Merc can stop a lot, lot quicker than a Morris Minor from any speed. So on any given stretch of road, should Mercs be allowed to drive faster because they are safer, or should Morris Minors be banned because they are more dangerous? I don't think either, but you can't compare apples and oranges. 1. Someone else is having your share of the accidents! 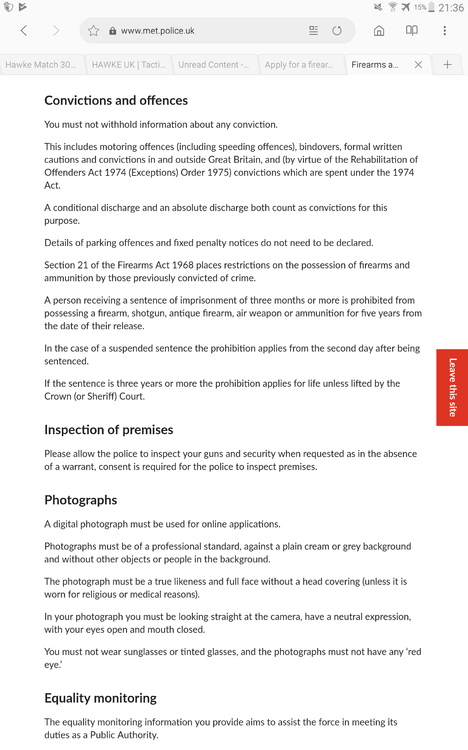 This is taken from the MET website and states that motoring offences need to be declared. The Met short of the mark again....they forgot those who voted to leave !! As said , take the course and keep your ears open. I got clocked by a camera in Nuneaton and was actually accelerating out of danger to avoid another vehicle ..36mph... when in normal cirumstances I am a stickler for limits, even the 60mph limit on normal normal non dual track road. How many of you can say that ? Take care ...as my motor cycle instructor told me, all those (with no known parentage) out there are trying to kill you. I still have drivers trying to mount my Land Rover who would never stop in a month of Sundays should I need to make an emergency stop. How often do you see a driver stuffed up the back of a truck so close they cannot see the road ahead. Was trained to hang back to enable a clear view ahead for likely problems and also a clear safe place to overtake if necessary....in additon to being able to STOP in an emergency. Had two Audi's pass me on the A46 Leicester ring road last night I was doing 70 and they went passed me like I was stationary and you could not have put another car between them. Those are the drivers who need the training course and a period of learning to ride a bike. I reckon for those that survive it, riding a bike is the best training for driving you can have. On my course there was plenty of confusion over the speed limit for trucks and vans that was never cleared up. Not that I intend to break the speed limits but accepting that it is a hazard of driving, when I do get caught again are you allowed a course every two years or is it every three? It's every 3, depending on your speed. I've already booked a place for 2022. I agree with the bike thing. My wife and I both ride bikes and it does make you more aware. Is this not a little confusing? You don't have to give information if you are given a fixed penalty notice but you have to give details of speeding offences! What are you supposed to do If a speeding offence is dealt with by fixed penalty notice? You will probably find that they are the people on their phones or otherwise distracted. It's not speed, it's in appropriate speed. You can't tell me that 90 mph on a clear German autobahn in dry weather is worse than 28 mph but on your phone or generally being off with the fairies and rubbish at driving. Fact 1 is BS. I drive every day and yet the last accident I had was over 10 years ago and not my fault - caused by someone overtaking (but not speeding) past a line of stationary cars stopped to let someone cross a zebra crossing - the person who drove into me thought the cars were just parked up. Indeed, I thought he was on coke because his eyes were blazing and he couldn't stand still. Fact 2 is BS : my car in a measured 70-0 braking test has a stopping distance of 148 ft. The highway code says 70-0 is 315 feet. I'm still waiting for a convincing answer on how fast you can go in a pick up. As I don't want anymore points / go on anymore courses I'll stick to 50 / 60 / 70, mind the lorry 3 inches from my bumper on the A66 whilst I was doing 50 on a single carriageway bit did make me twitchy. It's the same as non car based vans. We're hounded by camera vans in North Yorkshire so I do 50 everywhere, much to the annoyance of the long stream of traffic that usually builds up behind me. All this will soon be moot. On the news this morning - new EU regulation - all cars sold from 2022 to contain technology to read speed signs and keep said car within the posted limit. The UK intends to implement this ruling.